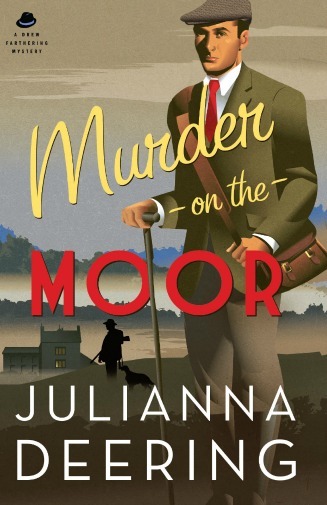 At the urgent request of Drew's old school friend, Hubert "Beaky" Bloodworth, Drew and Madeline Farthering come to Bloodworth Park Lodge in the midst of the Yorkshire moors, a place as moody and mysterious as a Brontë hero. According to Beaky, there have been several incidents of mischief making out on the moor, property destroyed, fires started, streams dammed up, sheep and cattle scattered and, if local gossip is to be believed, the sighting of the shadowy figure of a great black hound. Worst of all, the vicar has been found dead on the steps of the church, and no one can imagine who would want to kill him. Beaky is obviously smitten with his wife of eight months, the gorgeous and vivacious Sabrina Bloodworth, though it's hard to imagine what she sees in a man as awkward and plain as he. Drew can't help wondering if Sabrina's affections lie more with Beaky's money than himself and, just perhaps, with the fiery Welsh gamekeeper, Rhys Delwyn. Delwyn says poachers are to blame for the recent trouble, Sabrina claims the moor is haunted, and Beaky suspects that Carter Gray, a neighboring landowner with a longstanding grudge against the Bloodworths, is behind the episodes. But when someone else is murdered and the troubling incidents grow more threatening, Drew begins to suspect local ne'er-do-well Jack Midgley of more than poaching. But just how does Midgley fit into the scheme and who is paying him? It's up to Drew to look past his own prejudices, determine what is really going on, and find the killer before it's too late. "Deering smoothly blends suspense and humor with a touch of romance." "A fast-paced historical murder mystery that has beloved characters who are cunning, charming, and determined to get their man or woman and bring them to justice. The storyline is believable, with roller-coaster twists and turns one does not see coming. Deering is a gifted author and she knows what fans of historical mysteries look for." "For fans of Agatha Christie and Dorothy Sayers, these charming British mysteries are a treat not to be missed." "'And I sank down where I stood, and hid my face against the ground. I lay still a while: the night swept over the hill and over me and died moaning in the distance; the rain fell fast, wetting me afresh to the skin.'" At Farthering Place, nestled in the Hampshire countryside, the rain also fell fast, drumming against the window panes, joining the wind and the thunder to make the cold October night even more forbidding. Eyes closed, Drew Farthering lay on the sofa before the library fire, his head in his wife's lap, listening as she read from Jane Eyre. "Poor Jane. I'm glad we're in here and not out there." "Don't interrupt," Madeline said, but there was a smile playing at her lips and in her periwinkle-blue eyes. She was never very good at scolding. "'Could I but have stiffened to the still frost– the friendly numbness of death– it might have pelted on; I should not have felt it; but my yet living flesh shuddered at its chilling influence.'" "I beg your pardon, madam, but there is a telephone call for you, sir." "My yet living flesh shudders." Drew opened one baleful eye at the butler's interruption. "Is it critical, Denny?" Dennison merely looked appropriately grave. "I couldn't say, sir. The gentleman claims it is urgent." Drew sighed and sat up, disturbing the black-and-white cat sleeping on his chest and the pure white one nestled at his side. Drew stretched as well and then smoothed down the back of his hair. He couldn’t imagine who’d ring up this time of the evening. True, he’d been taking a bit more interest in Farlinford Processing these days, but surely any matter of urgency would be directed to Landis who managed the company for him. And it seemed likely that, if there were a difficulty concerning Madeline’s family in Chicago, the caller would have asked to speak to her directly. “Did the gentleman give his name?" "A Mr. Hubert Bloodworth, sir, of Bloodworth Park Lodge, Bunting’s Nest, Yorkshire." "Hubert . . . " Drew frowned and looked at Madeline. "Do we know any Bloodworths, darling?" "Well I certainly don't. Why don't you just go see what he wants?" She snickered at him. "And don't pout." "I do not pout," he said, standing with all the dignity he could muster. "I was merely thinking it sounded rather familiar." Dennison cleared his throat. "The gentleman, sir?" "Right. Right." Drew followed the butler out of the library and down the corridor to the study. "He's not selling anything, is he, Denny?" "He assures me he is not, sir. Shall I inquire again?" "No, that's all right. You toddle off to whatever it is you do this time of night, and I'll see to our Mr. Bloodworth." Drew frowned again as he picked up the telephone. Bloodworth. Bloodworth of Bunting’s Nest, Yorkshire. Not exactly Smith or Jones of Southampton. Could he have heard it before? "Drew Farthering here. What can I do for you?" "Ah, Drew," said an unfamiliar voice. "Thank God." Drew's frown deepened. "I beg your pardon. Do I know you?" "Do forgive me. I know it's been ages. I shouldn't have expected you to remember." The man made an apologetic sound somewhere between a chuckle and a cough. "Hubert Bloodworth. We were at Eton together." "Hubert Bloodworth," Drew mused half under his breath, and then a startled laugh escaped him as he pictured a gawky boy of fourteen with carrot-colored hair and jelly-jar spectacles and bony wrists that poked out of always-too-short coat sleeves. "Not Beaky Bloodworth from Holland House. Good heavens, it has been ages. Beaky old man, how are you?" "In a bit of a pickle, I'm afraid. That's why I called you. I've read about you in the papers you know, about you solving those murders. I thought you might be able to help me, too." "I haven't made headlines for months now you know, and I'm not an actual detective or a constable or anything, no matter what the papers say." "The police haven't done us any good so far anyway. We thought perhaps . . . "
"Oh, dear, I've made a muddle of it already. I say, Drew, would it be too much of a bother if I came over to Farthering Place and told you all about it? It's rather a long story." Drew chuckled. "Certainly. If you'd like. I can't promise I'll have a clue about what to do, but I'd be happy to listen. How about you come down next week sometime?" "No!" Beaky drew an audible breath, obviously struggling to compose himself. "I'm sorry, but I was hoping I might come round tonight. I'll try to keep it brief, I promise." "Tonight? All the way from Yorkshire? That's two hundred fifty miles." "Actually, I'm here at your inn. I've driven most of the day, and now–"
"In this storm? Are you mad?" "It was raining a bit when I left the Lodge, but the drive down wasn't so bad. Cold, of course, but that was all till I got into Hampshire. It's rather a devil of a storm, isn't it?" "Monstrous," Drew agreed. "Are you sure you hadn't rather take cover at the Queen Bess and come up in the morning?" "I know it's a wretched imposition, Drew, but if there's any way we could make it this evening, I'd be terribly grateful." "All right, come along. We'll be waiting for you." "Beaky Bloodworth?" Madeline pursed her lips, fighting a giggle. "Beaky?" "He did have a rather . . . memorable nose," Drew admitted, "but I expect he grew into it years ago." "Haven't you seen him since Eton?" Drew shook his head. "He went to Cambridge and we rather lost touch. Not that we were all that close, to be honest. I haven't thought about him in years. I never thought he'd track me down." "That's what you get for making a spectacle of yourself in the papers all the time." "I haven't made a spectacle of myself since that mess in Beaulieu nearly a year and a half ago." He patted his lean stomach. "I'm getting fat and lazy." "Yes, I've noticed." She pressed herself into his arms. "I don't suppose he said what he wanted to see you about." A flash of lightning illuminated the lawn and the driveway, revealing Dennison holding an umbrella over the head of someone wrapped in a long overcoat and with his hat pulled down to shield his face from the rain. Drew lifted one dark brow. "I suppose we'll find out now." There was a minor commotion at the front door, and then Dennison appeared. "Mr. Bloodworth, sir." He stepped back to reveal a young man in his mid-twenties, half a head taller than her husband and a good forty pounds lighter. 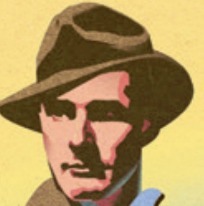 His clothes were rain soaked and no longer fresh, but they were quality goods and well tailored. Either he had a wife or an excellent valet or both. He looked as if he could well afford at least one of each. His face was pleasant if plain, but even under his thick glasses, his nose was certainly memorable. "Beaky old man!" Drew went to him, clasping his hand, drawing him into the room. "Come over to the fire. It's a beastly night. Tea, Denny, if you please. I think we can all do with a cup. Let me introduce you to my wife, Madeline." Madeline smiled into the man's bewildered pale blue eyes and offered her own hand. She had seen more true redheads since coming to England than she'd ever seen in America, but Beaky Bloodworth surpassed the most brilliant of them. "Mrs. Farthering, it is very good to meet you." He clasped her hand briefly, his wide mouth touched with a shy smile. "I feel as if we've met already after all those stories in the newspaper. Drew tells me they're exaggerated, but I'm hoping the two of you and Nicky Dennison are every bit as clever as they say." She glanced at Drew and then looked again at Beaky. "You know Nick?" "Oh, certainly. We were all at Eton together. Not that we were in the same house, but the two of them did get me out of a jam or two now and again. I've never forgotten it." "I could never abide bullies," Drew muttered, looking faintly embarrassed, "but I doubt you need anyone to rescue you from the Latin room cupboard at this late date." "And where is Nicky these days?" Beaky asked. "I understand he's your estate agent now." Drew nodded. "He'll step in when our Mr. Padgett is ready to retire. But he won't be back here before tomorrow afternoon, like as not." "That's rather a shame. I was hoping to see him, too." "He telephoned a couple of hours ago," Drew explained. "Seems he wrecked his car trying to get round a tree the storm brought down when he was coming back from Southampton. He's stranded in Durley until he can get it mended. But do sit down and tell us what's bothering you. Ah, here's tea." Mrs. Devon came in with a steaming pot of tea and some apple cake fresh from the oven, and soon Drew and Madeline and their guest were huddled before the fire. "Do forgive me barging in, Mrs. Farthering." Beaky clutched his teacup more tightly in his long, thin fingers. "Madeline, I mean. I should have telephoned from the Lodge before presuming to come all the way here, I know, but the line was down and I thought I might as well drive down as not. My wife's half distracted with worrying, and if I don't do something and soon, I'm afraid she'll go back to London, and Raphael with her." Madeline looked at Drew, baffled. "Raphael?" "Perhaps you ought to start at the beginning, old man," Drew suggested. "Where's this Lodge? And how'd you end up in Yorkshire? I thought your people were in Windsor." "They were," Beaky said. "But they're all gone now. Everyone save my sister Celia who's married to a doctor in Bournemouth. Anyway, last Christmas my Uncle Hubert passed on." "He's the one who sent you to Cambridge I take it," Drew said with a hint of a grin. "Well, we'll forgive him anyway." Beaky chuckled. "He was very insistent about me following in his footsteps, and without his patronage, the only way I could have joined you and Nicky at Oxford would have been as boot boy." "Well, never mind that, old man. But how did you end up in Yorkshire?" "Uncle left my father the old Lodge, Bloodworth Park Lodge, up near Bunting’s Nest and, not to be too vulgar about it, rather a lot of money along with it, but Father died not even a month afterward, so it all came to me. I was married in March, and it only seemed right to take the missus up to the ancestral hall to live. Start our own little dynasty, you know." "Ah, capital! Congratulations." Drew put his arm around Madeline's waist. "Wedded bliss is something I highly recommend." Beaky turned rather pink in the ears. "I've had nothing to complain of. At least not until now." He stopped, blinking as if he were startled. "No, I don't mean I have any complaints about my wife. Nothing like that. It's just that things have gotten rather . . . unsettled the past few weeks. And then last Wednesday– Well, last Wednesday they found our vicar dead on the steps of the church." "It was awful," Beaky said. "The police haven't any evidence. Someone bashed in his head with a stone from the walkway. No fingerprints. No motive. No suspects." "I read about the case," Drew told him. "Just a few lines in the Times. I didn't realize you'd be involved." "Involved? N-no. Nothing like that. It's just, well, there have been other things, several things, that have seemed odd. At the Lodge, I mean." Beaky smiled faintly and fidgeted with his teaspoon. "Sabrina tells me I tend to give all the details except the ones that matter." "Sabrina's your wife?" Madeline asked, encouraging him to go on. Beaky's pale eyes lit. "Yes, she's–"
"Hold on there," Drew said. "Not Sabrina Prestwick, is it? I heard she was married this spring. I had no idea you were the groom." "Sabrina Bloodworth now, thank you. I'm still not quite sure how it happened, but she said yes. If you've met her, you know she's rather wonderful." Drew still smiled, but there was a hint of wariness behind his eyes now. Who was this girl and what did Drew know about her? But that discussion would have to wait until Madeline and Drew were alone again. "But what's been happening at the Lodge?" Madeline pressed. "I hope no one else has died." "No, no. Nothing like that." Beaky took a nervous sip of tea. "Just little things mostly. I'm afraid the old place needs a bit of fixing up. Uncle wasn't much for spending his money, which is why I ended up with so much of it. But the north wing is completely uninhabitable, and there are always little creaks and groans and such in a place that size. Sabrina's got it into her head that the Lodge is haunted, or at least that wing is. And now that there's been a murder, she's sure we'll all be slaughtered in our beds." "And what do you think?" Drew asked, and there was that slight narrowing of his eyes that meant he was adding two and two and definitely getting something other than four. "I–" Beaky winced. "To be honest, Drew, I don't know what to make of it. There have been some rather peculiar sounds in the night, but most of those seem to be coming from the moor and not the house. Our gamekeeper says it's poachers more than likely, and I'd be surprised if there weren't any. Sabrina swears someone was following her the last time she and Raphael were out walking." Madeline glanced at Drew and then back at Beaky. "Who is Raphael?" "That would be her little terrier. Nothing but six pounds worth of hair, I think." Beaky smiled faintly. "He's not a bad little fellow, but I'm not sure he's going to be up to a Yorkshire winter. Sabrina either, for that matter." "If she doesn't like the cold in October," Drew observed, "she's not likely to think much of it in January and February." "I think she'll grow to love the old place. In time." Beaky set his teacup down and leaned forward in his chair. "I've got to figure out what's going on before she's so frightened she won't stay anymore. The police are horridly slow and don't seem to know what to do with a real murder investigation. They've been utterly useless on the other things, too. Haven't got time for our nonsense, I expect, but that doesn't let my wife sleep any better at night, I can tell you that." "I dunno. Sometimes the police are doing more than they let on. It's been only a few days. Perhaps you'd do best to let them carry on with their work." "I know it's a terrible imposition, Drew, but couldn't you come up to the Lodge? Just for a few days? You could have a look about and tell me what you think. You and your wife, of course. Maybe it is just poachers and the vicar's death has nothing to do with it. Either way, at least Sabrina would know something was being done." Drew glanced at Madeline, and she could see that little spark of eagerness in his gray eyes. It had been a long time since they'd had a case, and she knew he missed the challenge. "Why don't we talk it over in the morning?" Drew suggested. "It's late and you look all in." Beaky was immediately on his feet. "I know I've already been a terrible imposition. Is there a convenient time I could call on you in the morning?" "Breakfast is at nine," Drew said. "I can have Denny wake you an hour before if you like." "But– Oh, no, I couldn't possibly." Madeline took his arm. "Of course you can. Don't be silly. We have a very nice guest room, and I will definitely be offended if you refuse to stay in it." "You might as well agree," Drew advised. "There's no use your going back out tonight. I'll have Denny bring in your things, and you can turn in. We'll talk over breakfast, fair enough?" He looked as if he might protest again, but then he merely looked relieved. "Fair enough. And thank you." MURDR ON THE MOOR is followed by DEATH AT THORBURN HALL. Drop me a line to let me know what you think of Drew's latest adventure. Happy sleuthing! Would you like to read more excerpts?